We stock the Lotus Mondo 2, please get in touch for more information. 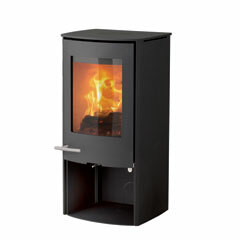 With subtle aesthetic details, the Lotus Mondo 2 wood burning stove has a simple and sleek design. The Mondo 2 wood burning stove offers the added appeal of a distinctive curving front. Featuring a cosy log storage compartment and an elegant stainless steel door handle, the Mondo 2 wood burning stove is available with a complete soapstone covering on the sides.